Last year was the first Christmas that Kindred spent with Liz and Scott Johnston of Franklin County. Liz's mother got Kindred a stocking with his name on it. Kindred's face lit up upon seeing it. "He was, 'Oh my gosh, I've never had something with my name on it,' " Liz said. What might not have been a big deal to most kids, "to him, it was just so amazing." Kindred was a kid of 19. He hadn't had a permanent home since he was removed from his mother's care at age 11, shuffling among extended family and foster care ever since. He moved in with "permanent" legal custodians in 2011, only to have them rescind the commitment three years later. But Kindred's days of wandering and wondering about his permanency are in the past. A bigger stocking might be necessary to accommodate his expanded name: Kindred Holbrook-Johnston. 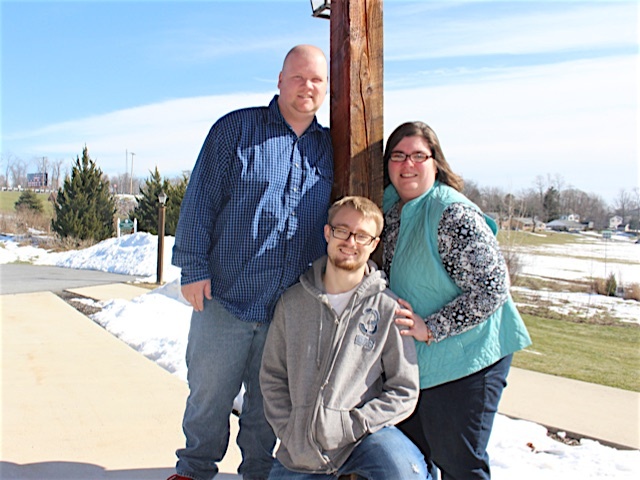 In April, Liz and Scott adopted Kindred, a recently turned 20-year-old who commutes from the family's Chambersburg home to his freshman year at Shippensburg University. If for Kindred permanency once seemed unlikely, Liz didn't think it was an option because of her professional relationship with him as a caseworker for Franklin County Children and Youth Services. However, like most tales of foster care, this one had twists and turns. And one thing Kindred had going for him, say those who have played a role in his pursuit of permanency, is his essential goodness. Before she joined Family Design Resources as an LSI paralegal in Franklin County, Ann Spoonhour was a caseworker in adjoining Huntingdon County. She met Kindred when he was 14 and remembered him as a "really good kid" whom she was surprised to see return to care at age 17. That's when Liz met him. He was the first teen-ager with whom she had worked. Based on what she had heard about him, she prepared herself to meet a "very angry, aggressive teenager." Instead, she found a "polite, kind kid" who was upset and asked for her help in getting out of foster care. Liz got to know him well. She attended his high school graduation. She went with him to a memorial service for a friend of his. "I tried to be there for the big events," she said, "take him out to dinner once in a while." However, he kept encountering roadblocks to permanency. She reached out to his birth family and engaged matching services, to no avail. Kindred started talking about leaving care. "I didn't want that to happen," Liz said, worried about how he would eat, where he would stay. She brought his case to a permanency roundtable, essentially a brainstorming session with representatives from other agencies. She got upset explaining Kindred's situation, she said, "And everybody could see that." Someone asked: Why don't you adopt him? On its face, the notion made some sense. After all, she and Scott, who is a site supervisor for a security company, were going through the approval process to become resource parents. But she had thought it would be prohibited because of her professional relationship with Kindred. She was wrong, and adoption of Kindred was an option. Meanwhile, Kindred was receiving child preparation services, a process designed to help a child in foster care make the transition to permanency. Liz asked the child preparation caseworker to bring up the possibility of Kindred living with Liz and Scott. "And his reaction was, 'When can I move?" He visited two or three times and got to know Scott before moving in in September 2015. Liz and Scott adopted him on April 29, 2016. "We just love him," Liz said. "He's a wonderful part of our family." In September, the three of them and Liz's younger sister and her fiance traveled to Ireland with Liz's parents, Michael and Stacey Mixell, who provided the trip as a Christmas present. Kindred is the first grandson for Liz's parents; her father, a wills and estates attorney, wanted to represent Liz and Scott at the adoption. Because he had no experience with adoptions, he relied on help from Roxanna Foust, who got to know Kindred when she was a Family Design Resources LSI paralegal in Franklin County. "Super Paralegal Roxy," as Mixell called her, walked him through the process and helped prepare court documents. She attended the adoption hearing. "I was thrilled to be a part of it," she said. "It is a day I will always remember." Kindred has that effect on people. It seems only fitting that his middle name is Spirit. "His name is Kindred Spirit, and he gets along with everybody," Liz said. "It just kind of goes with the name." You know the name. It's the one on the stocking.